If you want to unwind after a long day or just spend the night out with friends visit a Nevada bar. From sports bars to country bars to martini bars, we have them all listed for you. Read through our complete list and find the NV bar that you would like to visit! Kick back with some food and a few drinks at one of these college bars in NV. What better way to end the day after school then with one of the best Nevada college bars? 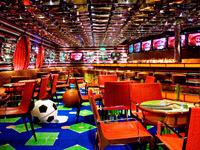 Looking for the best sports bars in Nevada? Below you will find a complete list of all of the best NV sports bars. If you are looking for a place to watch the big game, make sure you check out the Nevada sports bars listed here.